This will probably for the most of us the first Christmas with good weather and without snow, hot chocolate, Christmas songs, snowman’s, chocolate fondue (okay we can do this anyway:), but it definitely will be different. You probably also will celebrate your Christmas without your family, but don’t be sad there are also a lot benefits of being here and celebrate your Christmas in New Zealand. Do you see yourself already lie on the beach, with your Christmas head and watching to some passing dolphins. Maybe it is even to warm to put your Christmas head, don’t worry they also sell reindeer ears. In this blog we will give you some tips and ideas about what you can do in your holiday in this sunny New Zealand. – Do you want to see some dolphins, than it is a great idea to go to the Bay of Islands.There are also some beautiful beaches where you can get a good ten (of the weather is good off course). Stray and Kiwi experience are both driving up North. On their way they make both a few stops, but they are different. You can have a look on their websites for the stops. There is also a way to go as a day trip to the Bay of Island with the Naked bus or Intercity. -Do you want to do something sportive, before you going to eat a lot of food at Christmas. It is a little bit a longer drive down south, but it is definitely worth to go there. National Park, a beautiful place to walk. They have the best day-hiking-trip of the world, called the Tongariro crossing. It takes about 7 hours to do the walk, but it seems to be great! A totally different landscape with beautiful lakes. -Have you already been to Coromandel, No?! Great than this is your chance to go! Ever heard of the Cathedral Cove or Hot water Beach? That’s what you will see in Coromandel. Beautiful beaches, with just a few people, kayak tours, hot water beach, Cathedral cove, hiking tours, little villages, forests, diving etc.. One tip, bring your mosquito spray, because there are a lot of them in Coromandel. -What about some more adventures activities in Taupo and Rotorua. There are different extreme activities in Taupo and Rotorua, like rafting from a seven meter waterfall, abseiling in the Waitomo caves, tubing in the Caves etc.. But there is also a big culture part in Rotorua. Go to a marae and watch a Moari show and join the warrior dances and eat your food made on the Moari way, the Hangi. -It is almost impossible to spot a Kiwi bird in the wild, but there are different ways to see a Kiwi bird. Maybe less fun, but you can say you’ve see a Kiwi bird. But where, well off course in the Auckland Zoo, they have a few Kiwi birds. But beside these Kiwi birds, there are a lot of other animals who are fun to visit. In generally is the Auckland Zoo a fun place to spend one day of your holiday and a good thing it is not that expensive. -Do you still have to buy your Christmas presents, don’t worry there is one place where they have everything and succeed is guaranteed. It is a huge shopping mall called Sylvia park, it is just outside the CBD. Only 20 minutes with the bus or train. Off course also great for just shopping 😉 Ask at the Britomart what is the best and cheapest way to travel to Sylvia park. -You don’t have to travel far to go to the beach. There is a great beach, just outside the CBD, called Mission Bay. Really fun to go there on a sunny day. It is cheap to go there, only 2 dollars with the bus. You can also walk it, what is around 1 hour. Have you already done all of this or do you want to do something else, you can always ask us for more ideas, no worries! 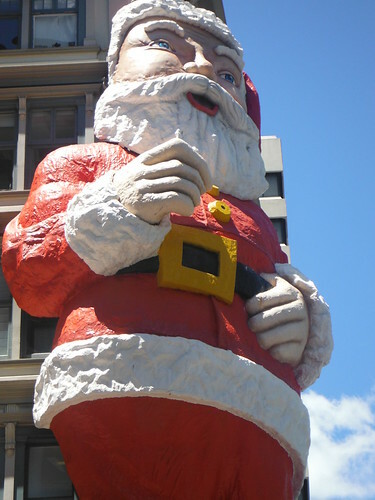 This entry was posted in Christmas holiday, INTERNeX, Internship, new zealand and tagged Christmas, holiday, INTERNeX, new zealand, tips on December 18, 2013 by INTERNeX New Zealand.